It’s really a long shot now. The article below is one we used to maintain when you used to be able to see lava flows on Arenal Volcano. It’s not impossible that it will come back to life any day but it quieted down to an occasional puff in 2009 and hasn’t made so much as a peep for six years. If it does come back to life we’ll start updating the optimal view map again. The other information below is still useful for people who what to get a glimpse of the volcano, lava or no, since the weather doesn’t even guarantee that. If you’re planning to visit Costa Rica I’d wager that the spectacular lava flows, smoking boulders, and glowing ash and cinder ejections, have got you considering Volcán Arenal as a stop on your itinerary, but did you know it’s a gamble? When you ante up for a few nights in a lava view hotel room you’re laying down a couple hundred bucks on the proposition that the weather and the magma will cooperate to provide you with a warm tropical night on a terrace under the stars watching Arenal put on a show with the birds and cicadas as a soundtrack. It’s not simply a matter of if the clouds will clear, or if the lava will be flowing, but where the lava will be flowing as well. 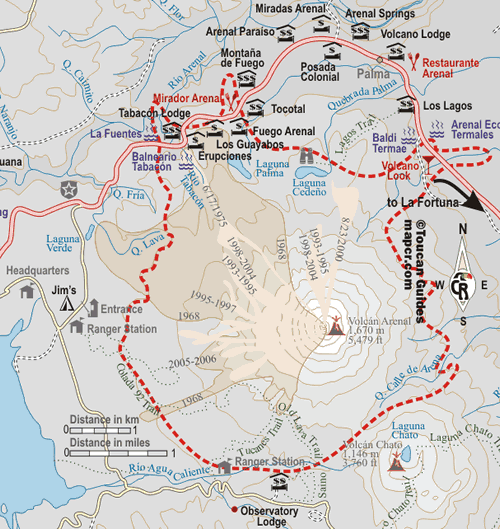 There are two active craters at the top of Arenal, and over the nearly four decades since the volcano re-awoke, the main channels for lava and other material have shifted around half of the cone. The lava flows have been indiscernible from the town of La Fortuna for years at a time, only to reappear when the activity switched from one crater to another or a section of the crater wall collapsed releasing the lava that was dammed behind it. Over recent years the major flows have shifted every few months and varied widely in intensity. In 2005 and the first half of 2006 the views were from the observatory. In the second half of 2006 spectacular lava flows were most visible from the north/northeast but currently intermediate flow levels are coursing down the southwest slopes out of view of many of the hotels in the Fortuna area. 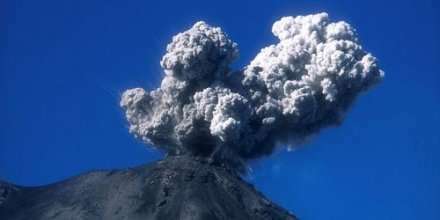 In March of 2009 the frequency and intensity of phreatic eruptions (release of gas and vapor) began a slow increase that eventually lead the Observatorio Vulcanológico y Sismológico de Costa Rica and ICE to increase of the alert level to 3 (out of 4) on June 12th. A few days later on June 16 a series of three dramatic explosive eruptions in crater C caused significant rock and lava flows down the south west flank (see map above). No one was injured and there was no property damage reported, although hikers in the National Park were told to evacuate as a precautionary measure. With some planning the odds can be in your favor for volcano viewing, but there is also one sure winning strategy—hedge your bets. There are dozens of activities in the area that don’t require cloudless skies, and if you spend all day hiking, birding, canopy touring, rafting, fishing, windsurfing, horseback riding, cycling, or on a wildlife viewing cruise, you’ll be too happy soaking your muscles in one of the local hot springs to be very disappointed if there’s no red hot lava show in the evening. To increase the odds of hitting the Arenal volcano jackpot that includes exciting daytime activities plus a perfect evening of volcano viewing you need to consider weather and location. As demonstrated on your local news channel every evening, no one can predict the weather with precision, but general trends are fairly reliable. In Chicago it’s warm in the summer and cold in the winter. Around Arenal it’s clearer and drier from December through April than May through November—when over two thirds of the annual 12 feet of rain fall. Fortunately, even in the heart of the rainy season the clouds tend to build during the day and clear in the evening or late into the night when views of the glowing lava are not hindered by the overwhelming glare of the sun. If you plan on staying a couple of nights, you shift the odds fairly heavily in your favor for a few clear hours of viewing. It may require taking advantage of the “call me when the clouds clear wake-up service” offered by most of the local hotels and a stumble out on the terrace at 3:30 a.m., but you’ll probably get a good look at the archetypical cone. How interesting what you see will be brings you to your second gamble; will the lava flow, and if it does will I be on the right side of the cone? Predicting the weather and getting a clear night to view Arenal is an absolute cinch compared to predicting volcanic activity. Volcán Arenal has been classified as “active” since its explosive and devastating eruption July 29, 1968 that saw its name changed from Cerro Arenal [a mountain peak] to volcán). Ongoing central vent and radial fissure eruptions, flank vents, pyroclastic flows, phreatic explosions, lahars, and lava flows are documented in hundreds of photographs, movies, and personal experiences. There’s very little you can do to ensure that the ongoing volcanic activity at Arenal will provide suitably dramatic photo ops during a short visit. Studies have shown that there may be a real though minute correlation between high tides and eruptive volcanic activity. This makes sense if you consider that the same forces that pull the ocean up the beach are pulling on the sea of magma beneath the earth’s crust drawing it to the surface. Generally the only way to know that Arenal will be dramatically active during your visit is to wait for a period of high activity, then get on a plane. Relatively dramatic lava flows, eruptive activity, and material ejections tend to continue for a few days to a few weeks once they start. If you can’t clear your schedule at a moments notice, you’ll just have to trust your luck, schedule your trip, and do your best to choose a hotel on the “right” side of the volcano so if the lava is flowing you’ll see it from your terrace. If you spend a couple of nights in Arenal, your odds are better than 50/50 that the clouds will cooperate and give you a few clear hours viewing the volcano, and the nearly constant activity of the volcano means at least some lava will probably be flowing, but you still have to roll the dice one more time before you can collect the spectacular experience and photographic jackpot. oh you can’t camp around here, there are snakes thicker than your legOn our first visit to Costa Rica a dozen years ago we were bicycling around the south side of Lake Arenal. We stopped at the tiny soda that comprised one third of the buildings in El Castillo for a bite to eat and to ask if anyone could suggest a site for our tent—“oh you can’t camp around here, there are snakes thicker than your leg, my cousin just killed one down by the lake last week.” Usually the warnings included jaguars, and bugs, but this time the samaritan had hit upon Sue’s weak spot, serpents and I knew getting her in a tent that night was going to be tough. I could almost see the gears of worry turning in her head as we cranked our bikes further around the lake on the rutted dirt road. We’d have to turn around and backtrack two hours to La Fortuna to find a snake proof hotel room. Although it would be hard to believe it if you travel this route today the last thing we’d passed was Tabacón hot springs where they had a few pools, a bar, some changing rooms and none too secure lockers. A far cry from the resort and suites that from the mid ‘90s until 2005 reigned as the spot for lava view accommodations. Then we rounded the bend and saw the most beautiful little lodge—brand new, and obviously triple our normal budget. I know a gift horse when I see one and I wasn’t about to complain if this ones mouth took a big bite out of our budget. My heart fell when a co-owner told us that unfortunately the Arenal Vista Lodge wouldn’t be open for business for another week. He did offer to give us a tour. The front picture windows of the tile and hardwood rooms were step staggered along a small ridge affording each with privacy and views. we watch the catapulting red hot boulders and lava for an hour or so before the clouds closed in As we walked and talked about the great location on the southwest side of the volcano where the lava show turned on most nights, we worked out a deal where we would give some English lessons to the new staff in training, then we would spend the night as test guests. That night we watch the catapulting red hot boulders and lava for an hour or so before the clouds closed in and we crawled into bed to the sound of raindrops on the roof of our very snake proof room. Needless to say I was happy not to be in a tent. For years Tabacón hot springs and resort enjoyed an enviable location at the mouth of a shallow valley with running hot lava at the top and running hot water at the bottom. Just far enough from the crater to prevent frequent evacuations but close enough to nearly guarantee a show every night. The dashed line shows the boundary of the zone designated R1 or the highest risk Arenal Volcano danger zone by the Observatorio Vulcanológico y Sismológico de Costa Rica. There are four other zones of decreasing risk outside of zone R1. Although the Observatory Lodge is close to the boundary it is actually quite safe because it’s located high atop the deep ravine between the lodge and the zone. Tabacón became perhaps the single best known resort hotel in Costa Rica despite sometimes musty rooms, mobs of day trippers in tour buses, and indifference engendered by the knowledge that it was the only game in town holding both the volcano view and hot springs aces in the hole. In 2005 the cards started to re-shuffle as the northern crater quieted and the southern resumed the role that it had relinquished in the ‘90s as the main vent. Even before the lava shifted Tabacón’s perfect location was in jeopardy as the resort quietly waged battle with the government of Costa Rica over safety concerns. Drawing lines on a map defining a safe zone is a delicate balancing act. When the scientists of the Smithsonian Institute chose the location for their observatory in 1987 they selected a vantage point on a ridge with the deep Río Agua Caliente gorge between their instruments, labs, and sleeping quarters and the active crater 2.5 km distant. 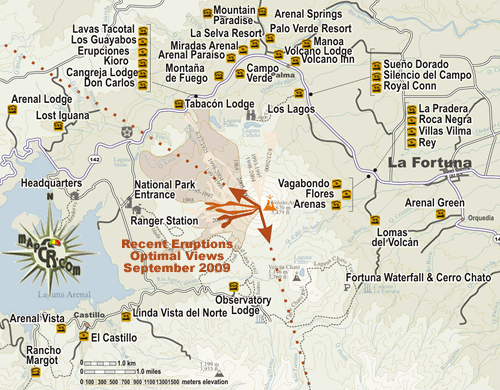 The resort, while the same distance from the crater straddles the Río Tabacón and if the lava flow is sufficient, or a major pyroclastic event (hot ash, cinders, gasses and rock traveling over a hundred mph downhill) occurs gravity dictates that the volcanic material will follow the same path as the water currently does. In fact 78 people died when the village of Tabacón was destroyed along with Pueblo Nuevo in the major eruption of 1968. The stakes are high on both sides. The government has to consider the possibility of the loss of life. The resort might be safely evacuated before being destroyed by a major event, but the negative publicity of such a melodrama hyped in the international media could still cause hundreds of millions of dollars in damage to tourism across the country. The resort is obviously fighting for its life. If they were forced to move, they would certainly never find a comparable location and would be just as devastated as if they were leveled by the volcano. 2015 – vulcanologists from the University of Costa Rica continue to warn that the volcano is “resting” not extinct. It may be 10 days or it may be 10 years but it is expected to produce lava again. Perhaps the 2009 shuffle of the best location for volcano viewing is just what the doctor ordered for Tabacón. The loss of their guaranteed views means a drop in appeal, and they may be forced to clear the air in their rooms and adjust their attitudes to maintain their current popularity. It also means a reduced appearance of risk. This may be deceiving though since changes in flow patterns generally follow the collapse of a section of crater wall that can trigger a pyroclastic flow. Pyroclasitc flows are blasts of superheated air, poison gas, cinders and rocks traveling at over a hundred miles an hour. If the lava switches paths back towards Tabacón it may be preceded by such an avalanche funneled down the Tabacón river valley like the ones in 1975 and 1993. In each of these years, cinders and rocks (1/2”) reached the pools of the resort but in small quantities and no one was injured. No matter how carefully you stack the cards in your favor by researching the hotels, weather, and recent flows, lava viewing at Arenal Volcano is a gamble. No matter how carefully you stack the cards in your favor by researching the hotels, weather, and recent flows, lava viewing at Arenal Volcano is a gamble. If you arrive for a night’s stay adamant about seeing a spectacular show you may go away disappointed. On the other hand if you plan a few days in the botanical and butterfly gardens or the rainforest canopies of the Arenal area, hiking to the waterfalls, fishing in the lake, or even spelunking in the nearby Venado Caverns you’ll certainly have a great time, and you may hit the jackpot and see and incredible pyrotechnic display of nature’s power as a bonus.